Arguably the artist’s most important peace time nocturne, Beachy Head, 1939, is an iconic Ravilious watercolour. The Towner Art Gallery have added the watercolour to its permanent collection which has been made possible thanks to support from Art Fund, the National Heritage Memorial Fund, the Arts Council England/Victoria and Albert Museum Purchase Grant Fund, The Monument Trust and Eastbourne Arts Circle. Beachy Head, painted on the cusp of world war, demonstrates Ravilious' perspective and painting style, which he went on to employ in many other important wartime paintings during his time as an official war artist, making this work an important piece of national heritage. The painting depicts the view across the rolling hills to Beachy Head, where the lighthouse forms a focal point. 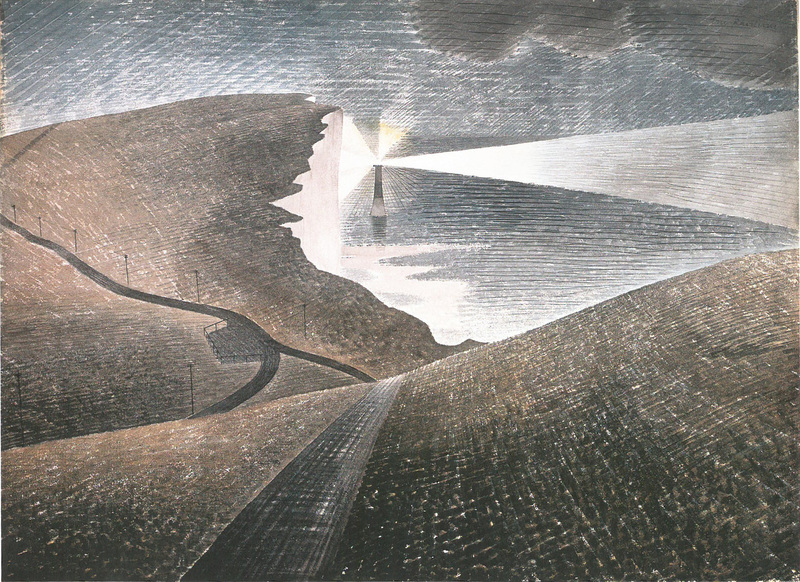 The artist emphasises the manmade elements in the landscape with the winding road and snaking telegraph poles and significantly, the Beachy Head lighthouse which is central to the image where its light beams fan out in geometric form. The lighthouse and cliffs are both local and national landmarks.